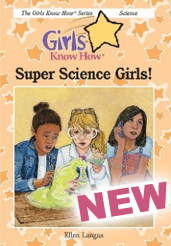 Haverford, PA – April 24, 2017 – Girls Know How®, a book series dedicated to encouraging girls to explore the careers of their dreams, announces the release of its fourth book, Super Science Girls!, on April 27 in conjunction with Take Our Daughters and Sons to Work® Day. Girls Know How books allow kids to experience diverse characters and gain subtle exposure to careers, while enabling parents and teachers to interact and keep the conversation going about career paths. Each book within the fiction chapter-book series for tweens introduces a different career, and a character based on a real-life successful female role model. Sylvia Todd, who created the popular online Sylvia’s Super-Awesome Maker Show at age 8, serves as the real-life inspiration behind Sylvia’s character in Super Science Girls! “Girls are as naturally inquisitive as boys, and if they are exposed to science at a young age, they are likely to embrace it,” says Pat Woody Reeves, the former chief engineer of the U.S. Naval Surface Warfare Center whose career served as the basis for one of the characters in Super Science Girls! “Helping girls discover the relevance of science, technology, engineering and math (STEM) in everyday life stimulates curiosity and problem-solving skills, and introduces a variety of career paths,” according to Langas, who has held positions with Corning Inc. and Westinghouse, and served as a corporate officer and popular program host at QVC, Inc.
Super Science Girls! explores the exciting world of science through the eyes of Sylvia and her best friend Kristen, who dream of winning the middle school science fair competition together. That is until Indra, the new “it” girl at school, tries to win Kristen’s friendship and undermine their plans. Sylvia finds herself on the outside looking in as Kristen gets swept up into Indra’s cool world of fashion and friends. She discovers that sometimes things aren’t what they seem, as she learns the rewards of perseverance, the meaning of friendship and that being true to oneself is more important than winning. 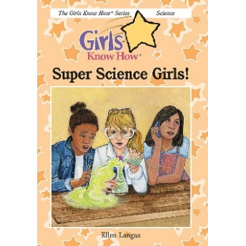 In addition, the book introduces experiments, the scientific method, women in science, plus activities and Girls Want to Know interviews. “We want girls to know that with hard work, perseverance and passion, they can achieve anything to which they set their minds,” says Langas. In celebration of Take Our Daughters and Sons to Work Day, Girls Know How will donate one book to Girls Inc. of Greater Philadelphia & Southern New Jersey for every two sold through April 30.